Fall is here, and we all know that means new marketing campaigns. 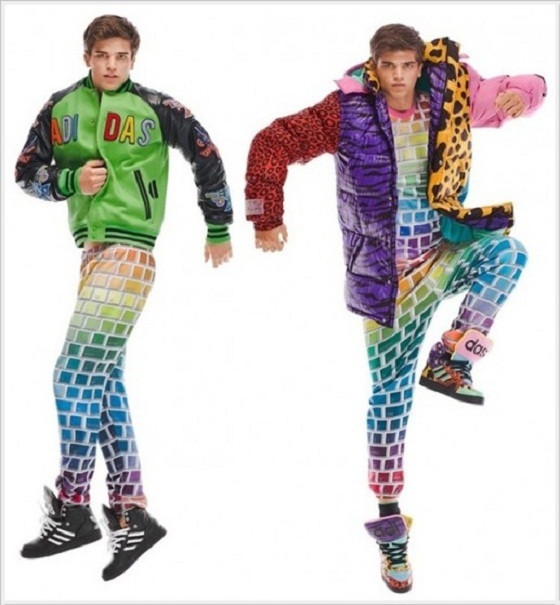 This season, fashion has moved into a new marketing realm: 3D interaction. Two major companies have begun to incorporate 3D technology to display and attract consumers to their newest clothing lines, including shoes, hats and jackets. German-based Adidas AG has been a major player in the sports apparel industry for years. Everyone has had a pair of Adidas and everyone would recommend the company. But, that does not stop the German-engineered apparel mogul. They have introduced 3D technology into the shopping experience. Recently, in Peru, Adidas presented a new way to market clothing using a 3D interface! Consumers had the chance to view themselves with a 3D rendered graphic that gives the illusion of wearing the new line of clothing. The realistic images were rendered in real time. Furthermore, the technology followed all natural body movements, giving the consumer a chance to see what the clothing would look like as they moved. Adidas has taken marketing and technology to the next level: pictures were snapped and digital postcards were available to all participants. I can imagine the caption, “I saw this jacket, and I want you to buy it, thanks mom!” Within the first week of this project, Adidas had over 1,000 digital postcards that equaled free social media marketing. This project was created by Zero Creative—a media company that specializes in 3D digital signage. The company is based out of the Netherlands, and they pride themselves on “3D without glasses.” Zero Creative was just ranked #43 in Fast50, which is a ranking of the top 50 fastest-growing technology companies in the Netherlands. 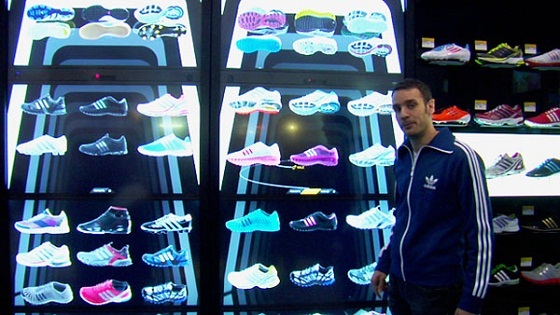 There is also the 3D interactive shopping experience provided by Adidas called adiVERSE. The user has the ability to shop for the shoe digitally in the store. The Adidas adiVERSE wall can also sway the skeptic by letting consumers read objective reviews and tweets from around the Web, good or bad, giving the ultimate decision to the consumer. One of the most quintessential ideas of Americana is a multinational corporation that has customers worldwide. Nike, Inc. has been creative on both the product and marketing front…we all know the symbolic “swoosh.” Launching the new “Nike Lunar Eclipse+ 2″ in India, the company used a 3D solution to display the new technology. Nike used Zero Creative’s glasses-free 3D and touchless interaction technology in March 2012 to launch the new product. The Indian customers were captured using a 110″ glasses-free 3D video wall, and participants were able to interact with the new Nike Lunar Eclipse +2 product and others. Consumers had the opportunity to use “intuitive human gestures” to play with the new products as well. Everything was filmed and posted to YouTube for social media marketing. There were hundreds of people lined up for this experience, and it was an awesome way for Nike to launch a new product by incorporating technology, marketing and genuine human interest. The link below shows the process and celebration that took place in India over this new form of 3D marketing infused with social media marketing. In general, we know that marketing is changing quickly and these kinds of examples show that it is necessary to integrate new technology that involves the customer. With Adidas rolling out the digital postcards, and Nike using the 110” interactive display wall, more companies must upgrade marketing efforts in order to keep up with competition. I personally want to shop in a digital store, just for the experience. Furthermore, I would like to be able to try on clothing in a digital fashion. Honestly, it saves times, gives me all the pertinent information I need, and it would be fun to participate in such activities. Digital fashion and that thing Nike introduced look really interesting. But I don’t quite get the idea of Adidas shopping tool. Why would I go to the real store to shop digitally. Isn’t it a better idea to implement it in the online-store?